Pakistan Badminton National Champion, Miss Mahoor Shahzad won the Annapurna Corporate Invitational International Badminton Tournament Championships 2018 held at Kathmandu, Nepal from 23rd to 28th July, 2018. 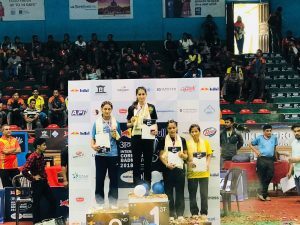 Mahoor beat Rashila Maharajan of Nepal in the finals by 21-15 and 21-10. Players from India, Bangladesh Pakistan and Nepal participated in this invitational tournament. Badminton Asia Confederation has also selected Miss Mahoor Shahzad for the Asia Olympic Project (AOP) Program, an initiative undertaken for the preparation of next Olympic games.